RAC/SPA has organized in the framework of the MedMPAnet project (MedPartnership) the 4th regional training session on ecological monitoring in marine protected areas, from 22 to 27 September 2014. The need to address SPAs representativity, replication and their connectivity in the Mediterranean is, in reality, the need to understand and deliver systematic conservation planning and best practice in applying MPA network design principles. 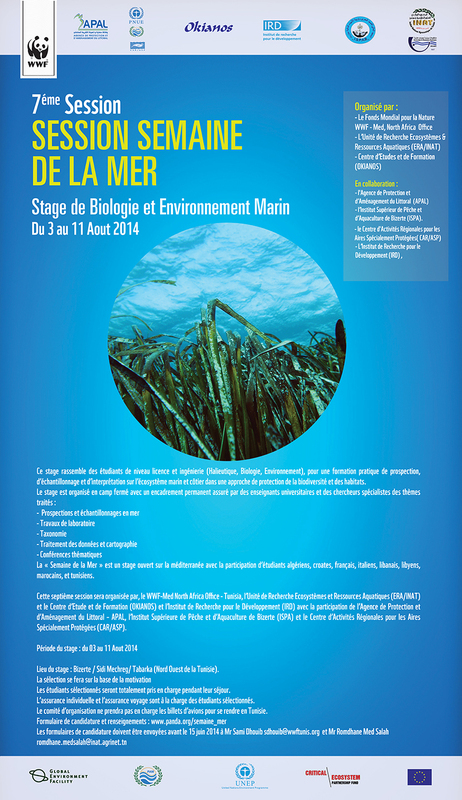 A marine biology and environment internship: "La Semaine de la Mer" used, since six years, to be organized in collaboration between WWF Med North Africa Office (Tunisia), research unit Ecosystems & Aquatic Resources of the National Agronomic Institute of Tunisia (ERA/INAT) and the Centre for Studies and Training Okianos in Tabarka. This internship brings together undergraduate and engineer science students (Fisheries, Biology, Environment), for a practical training on prospecting, sampling and interpretation of marine and coastal ecosystems with a biodiversity and habitats protection approach. "The Sea Week" can be attended by Algerian , Croatian, French, Italian, Lebanese, Libyan, Moroccan, and Tunisian students.